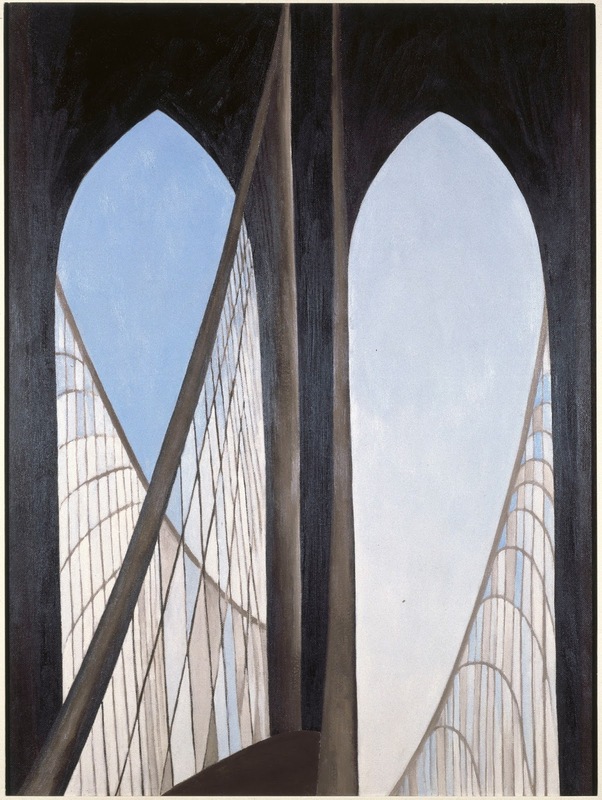 Georgia O'Keeffe: Living Modern at the Brooklyn Museum is an unique exhibition that focuses on the presentation of the artist's persona. Along with the collection of works that maps O'Keeffe's artistic career, it brings together her personal wardrobe that has never been studied before. Throughout her life, O'Keeffe fascinated and inspired her fellow artists and photographers, this exhibition also brings together portraits of the artist made by them. At a time when the art scene was dominated by male artists, O'Keeffe earned a name for herself as someone with equal if not more talents than the boys. Before she reached the pinnacle of her career, photographs of O'Keeffe by her then husband Alfred Stieglitz captured her as a self-assured and cultivated woman. In 1916, Stieglitz presented her drawings in a group show followed by a one-person show in 1917. Gradually, O'Keeffe gained prominence as an artist of indomitable force. The exhibition begins with a few of her early drawings when she worked as an illustrator for fashion magazines. These examples prefigure her sophisticated eye for color, composition, fashion and design. In the next gallery, the exhibition moves onto O'Keefe's watercolor drawings made in the 1910s and 20s. 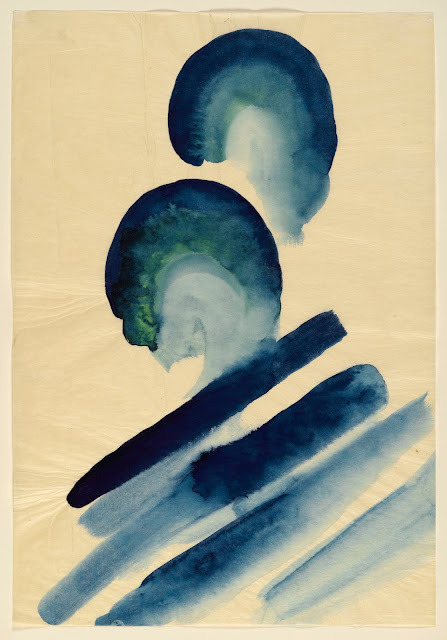 For example, Blue #2 (1916) shows her sensibility for color and layering. The use of gradation to suggest depth and texture would later become one of her signatures in the flower paintings. Unlike other museum surveys of the artist, Georgia O'Keeffe: Living Modern includes a substantial number of garments that were attributed to her as well those worn by her. 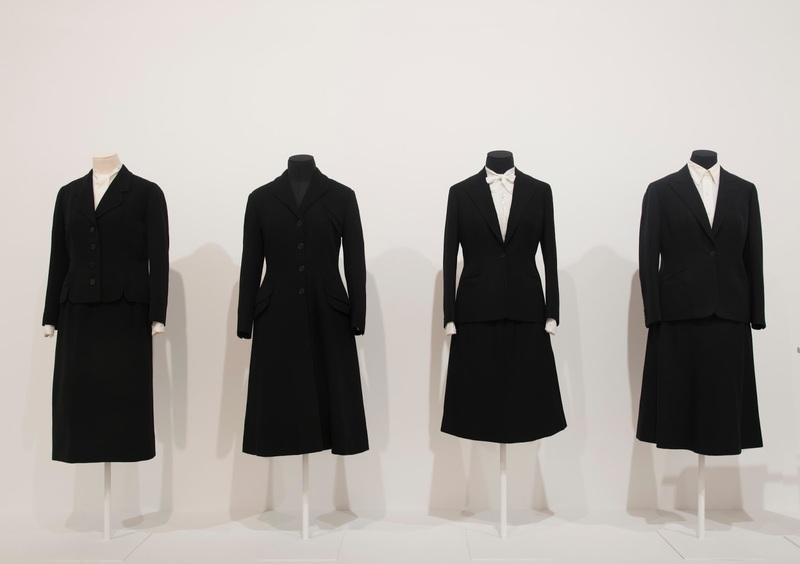 The wardrobe selection highlights a side of O'Keeffe's persona as an independent and modern woman of her time. 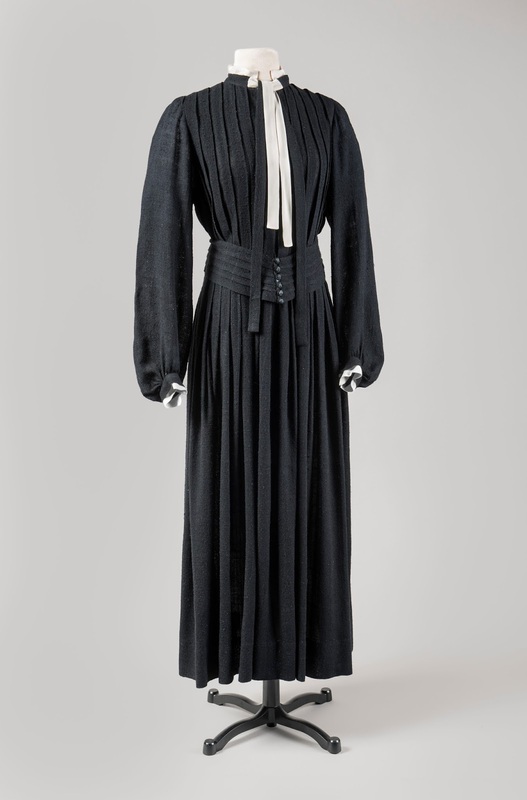 There are pieces of crepe dresses fashioned with the drop waist style that liberated women from tight corsets in the 1920s. 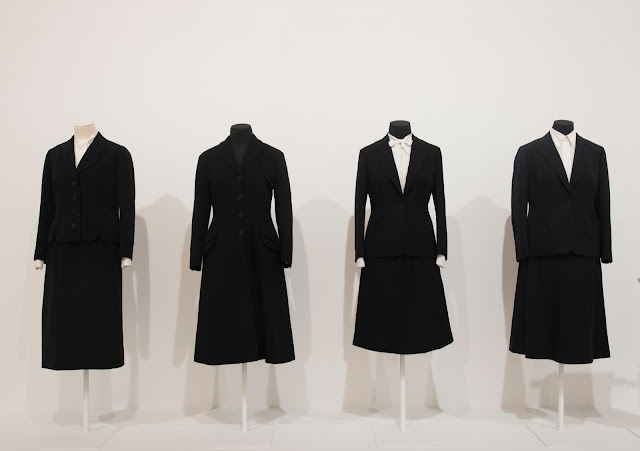 Also, there are the black and white dresses that show elegance through the mix of femininity with masculinity. 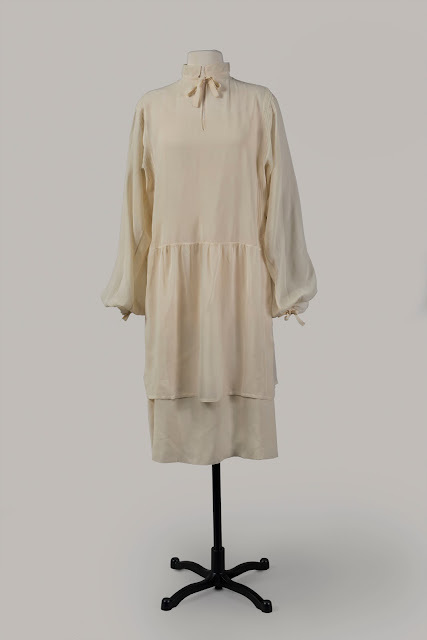 With these garments, they show the artist's affinity for working with a limited palette while turning out complicated and detailed designs. 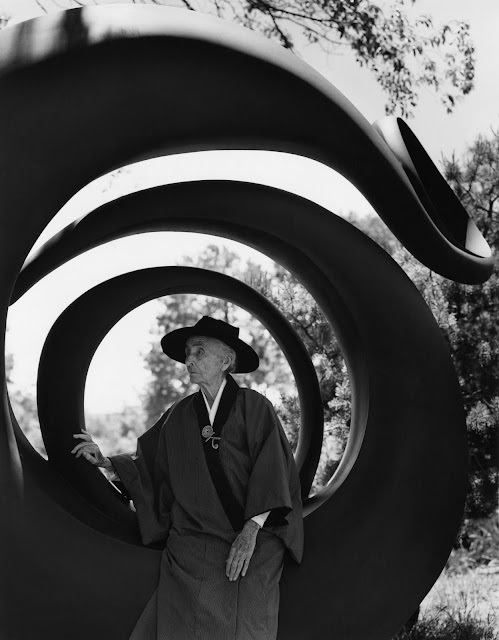 Near the end of her life, O'Keeffe still preferred to wear black and white, though from time to time she also worn plaid and denim when she painted en plein air in New Mexico. 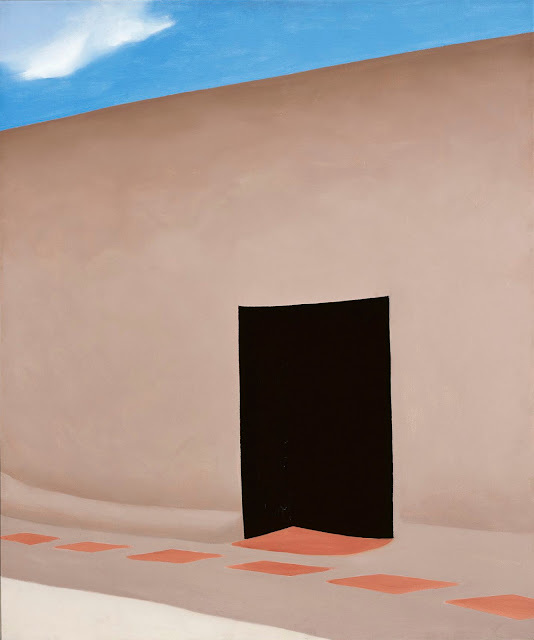 Georgia O'Keeffe Museum, Santa Fe, N.M. 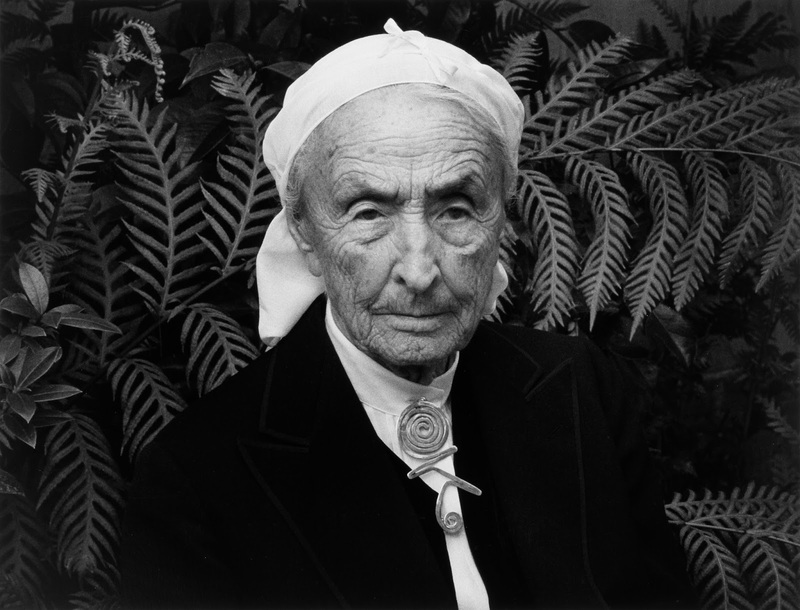 According to the current exhibition, O'Keeffe's life and work had been well-documented. In between the different sections, monitors play films of the artist at work, and of the artist talking about her work. However compared to the number of films, photography was the medium that captured a greater number of her portraits. Those were taken by different artists during different times of her life, they show the artist playing up to the construction of her own myth and legacy. 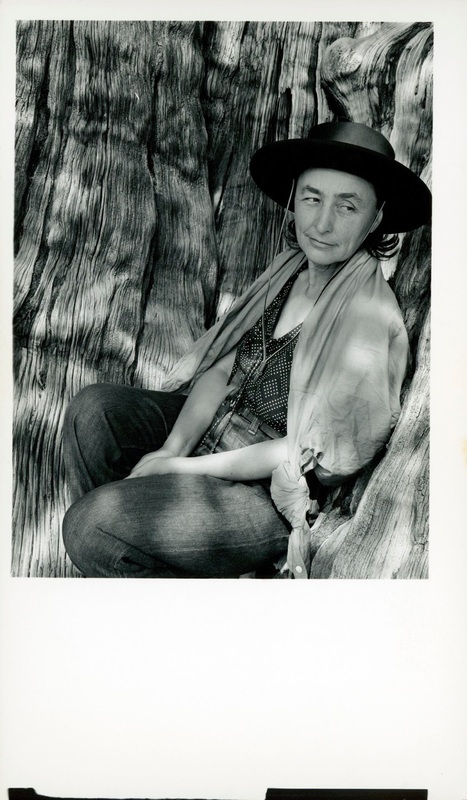 The persona of each photograph varies from one to the next, at the same time, each of them also show the relationship between O'Keeffe and her photographer. Just to name some in this selection, they are Ansel Adams, Richard Avedon, Cecil Beaton, Dan Budnik, Irving Penn, Bruce Weber and etc,. For instance, Ansel Adams and Georgia O'Keeffe shared a love for nature and the natural world in their lifelong friendship. Since they were young until in old age, they often traveled together and Adams would go on to make famous photographs of O'Keeffe. In the one taken in 1938, the artist is depicted as a middle-age woman sitting in an old tree smilingly contemplating the nature that surround her. The scenery is relaxed and the artist looks to be lost in reverie. Decades later, the 1981 photograph shows the artist in her advanced years whose face is looking right into the camera. The curvaceous leaves are styled to frame the artist, and the photograph shows a woman who defined nature in her famous paintings, as opposed in the earlier one where nature defined her character. Georgia O'Keefe Museum, Santa Fe, N.M.
Bruce Weber and Nan Bush Collection, New York. In 1984 the fashion photographer Bruce Weber presented O'Keeffe as an enduring style icon. His photograph places the artist inside one of her own sculptures called Abstraction (ca. 1940s) wearing one of her signature black hats and a kimono style day gown, which are also in the exhibition. The shell-like shape of her sculpture echoes the coiled metal pin that was once made and given to her by Alexander Calder. With one hand touching the sculpture and the other gently resting on her lap, it reveals a white shirt she is wearing under the dark gown. gazing away from the camera, O'Keeffe's posture is like a model posing for viewer. This is one of the photographs that precisely shows the artist as an image maker, someone who knows how to present herself not only as an artist but also a fashionista. 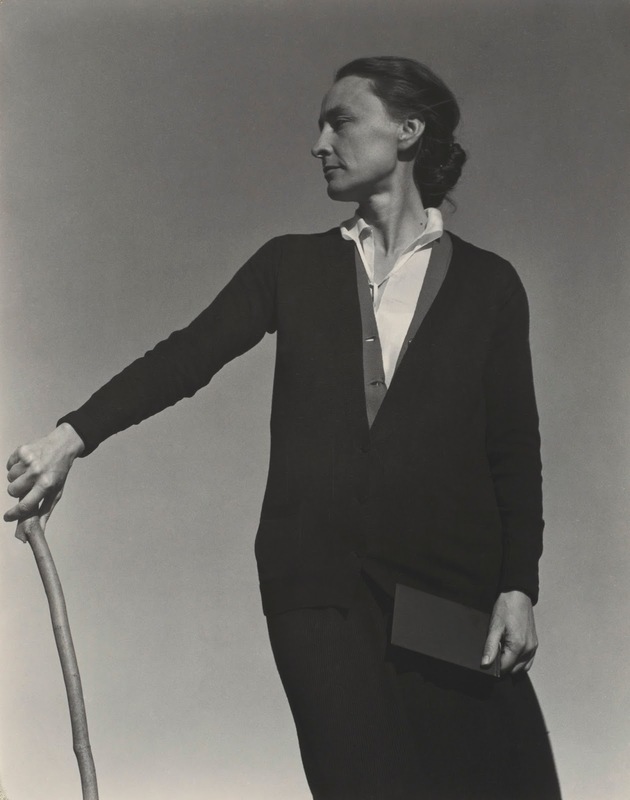 The most enjoyable aspect of Georgia O'Keeffe: Living Modern is the curatorial concept of examining the artist persona using her works, wardrobe and photo-portraits. It is unlike other survey exhibitions of the artist I have seen before. Also, organized according to the different places O'Keeffe traveled and lived, this has made the overall exhibition easy to follow. For people who know her only by her flower paintings, there are her works of cityscapes and architecture attesting to her broad range of interests and skills as a painter. However, for some who know slightly more about her artistic career, the show falls a little short on presenting her work according to content and concept. For instance, some of her dresses and paintings are grouped together because they share the same colors and formal qualities. 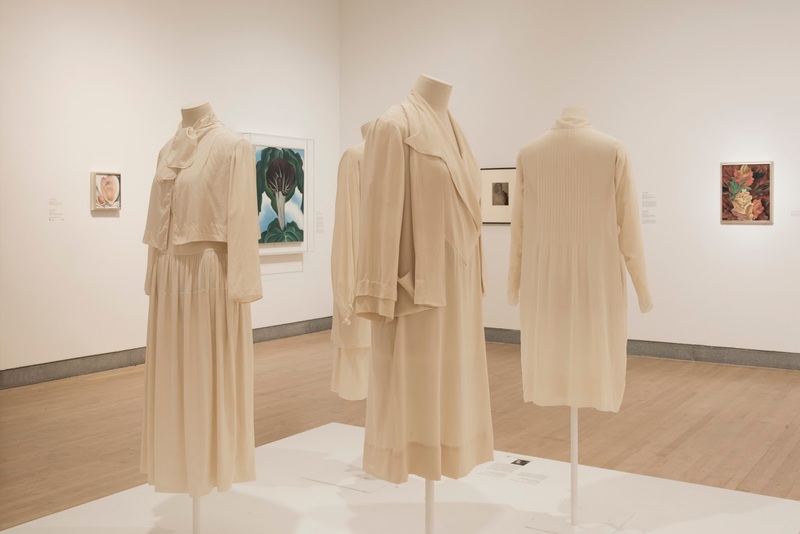 If the title "modern living" points to the focus of presenting how O'Keeffe led an aesthetic lifestyle, the exhibition is a journey taking one closer to understanding Georgia O'Keeffe as an artist of multiple dimensions.